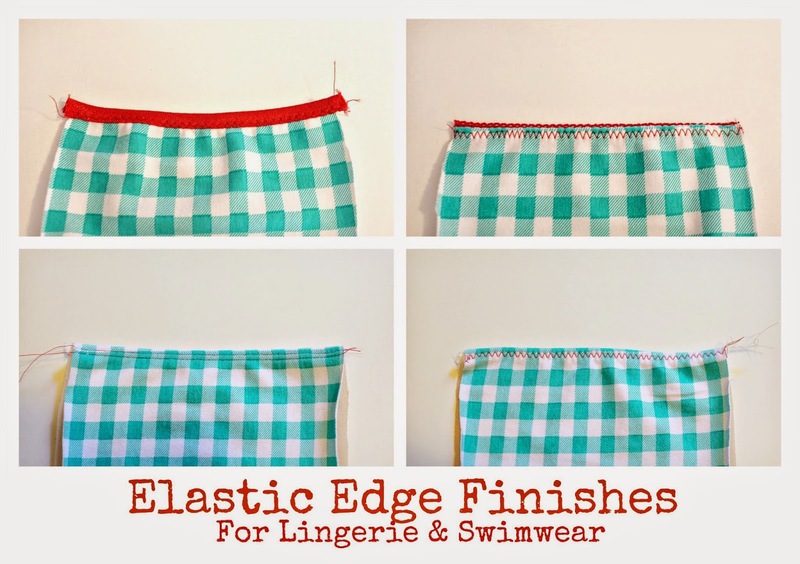 In my patterns, I generally glance over how to apply elastic edge finishes. There are so many different types of elastic, and different methods of application. Here, I'm going to go more in depth into 4 different edge finishes, serger/overlock machine optional! These are four basic finishes. I like to use the Fold Over & Picot Elastic for lingerie edge finishes, while the Twin Stitched and Zig-Zag finishes are great for swimwear as they create a clean, but snug fitting edge. 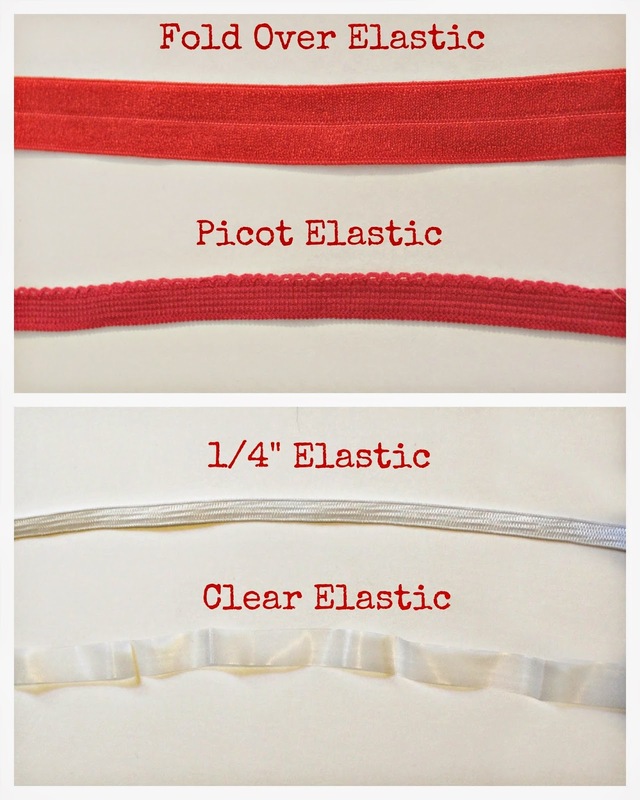 Above are the basic types of elastic you may want to use for Lingerie or Swimwear. Picot & Fold Over are best for Lingerie while plain elastic works great for swimwear. You can buy specific swimwear elastic that is suitable for wear in chlorine - just search for "Swimwear elastic." I use 1/4" swimwear elastic on my swim items, but you can also experiment with clear elastic and elastic of different widths. Elastic comes in different weights and amounts of stretch. Because of this, I generally do not add elastic lengths in my patterns. I find the best way to get the most comfortable fit is to experiment with the amount of tension applied to the elastic you have. 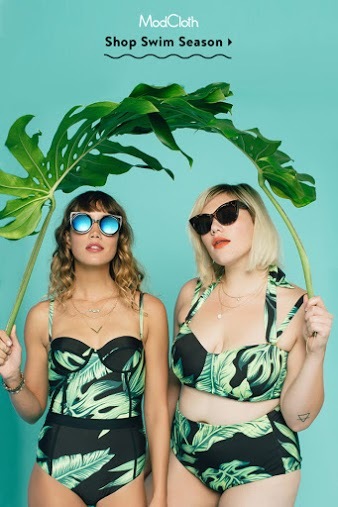 You want the elastic to gently contour the edge of the garment and create a snug fit, but not ruche or gather the fabric underneath. You will find that if you are working with stretch knits, like a spandex swimwear fabric or cotton/lycra jersey, you will want to apply less tension than if you were working with a bias cut, woven quilting cotton. After you sew a couple samples, I think you'll find that it quickly becomes second nature. I have an "Anything Goes" mindset to sewing. I firmly believe that there are countless ways to sew a garment or perfect a technique. These are a few techniques that I personally like to use, but it doesn't mean they are the only way to do it! Experiment, try different things, and find the technique that works best for you. 1. 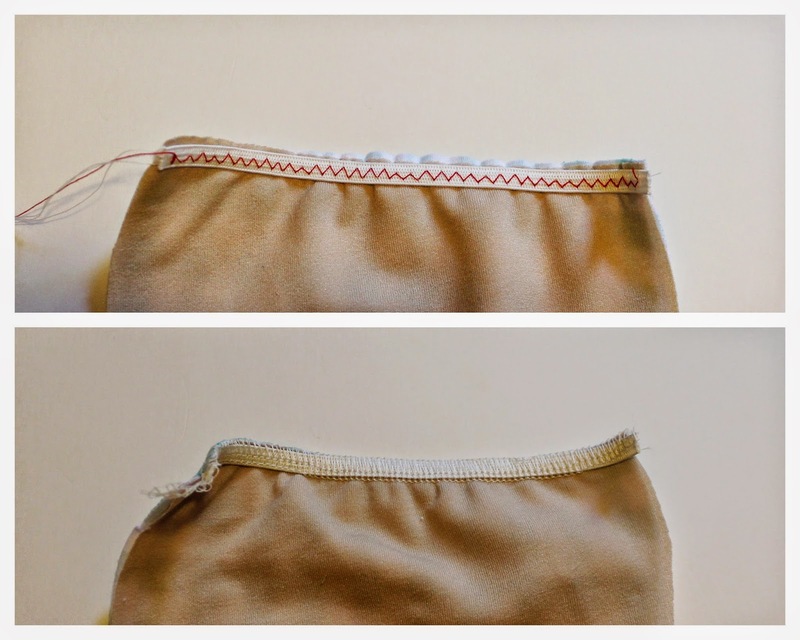 Using a zig-zag stitch, baste your FOE (Fold Over Elastic) onto the wrong side of the garment. Most of my patterns have a 1/4" hem allowance, so I inset my FOE. When you are basting, apply slight tension to the elastic - this means you gently pull on the elastic while stitching it down. You'll see that the fabric very slightly "shrinks" under the tension. I find it's best to experiment on mock-up garments to see how much tension works best. After you do this a few times, it will feel like second nature. 2. Trim back any excess fabric on the right side. 4. Voila! Your edge is bound in elastic. 1. 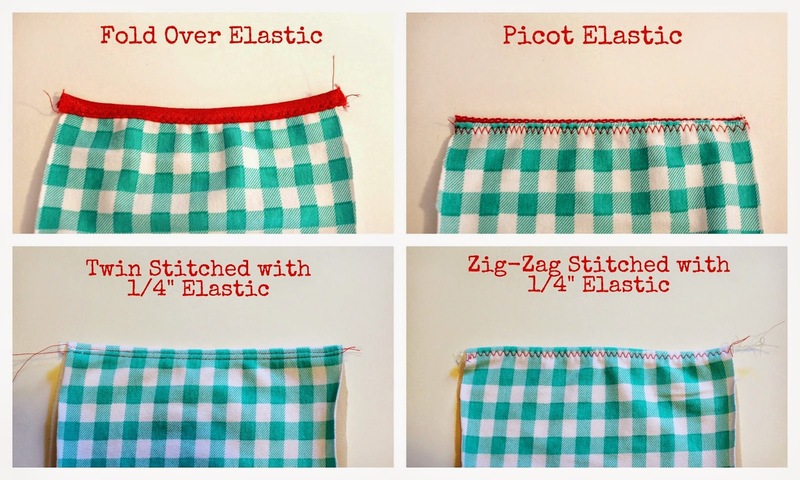 Baste your picot elastic onto the right side of the fabric using a zig-zag stitch. The picot, or decorative edge of the elastic should be pointing in towards the fabric. As you baste, apply a slight amount of tension to the elastic. 2. Trim back any excess fabric. Turn the elastic under, towards the wrong side and zig-zag stitch down. 1. 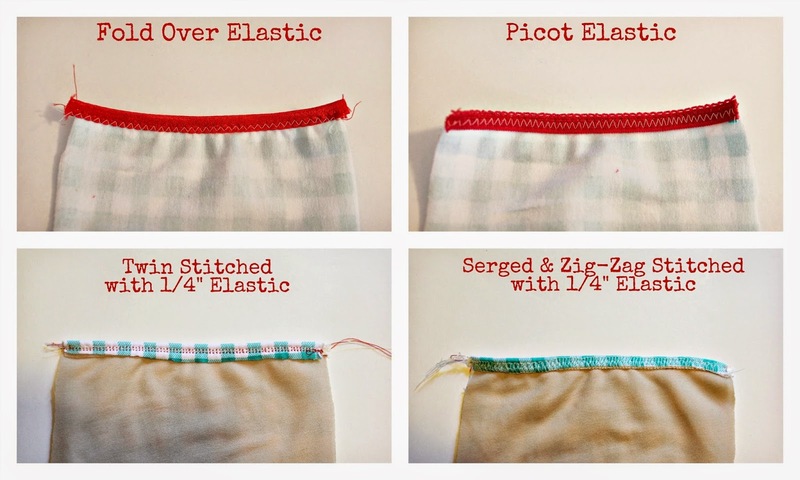 Baste the elastic to the wrong side of the garment using either a zig-zag stitch or your serger/overlock machine. Apply a slight amount of tension to the elastic - you can see in the photos below how the elastic slightly "shrinks" down the edge, which will create a snug fit. 2. Fold elastic under and top stitch down. You can either use a Twin Needle or a Zig Zag Stitch. If you've never used a twin needle before, it is really easy and creates professional results! 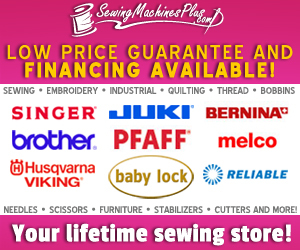 Your sewing machine should come with a detachable peg that can be inserted into the top of the machine to put a 2nd spool of thread. 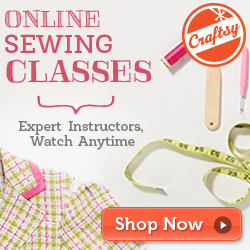 Insert your twin needle, and make sure your sewing machine is set to stitch a straight stitch. Thread your machine as you normally would, but use two spools of thread. This stitch will create two lines of straight stitching on the front, with a zig-zag on the back. 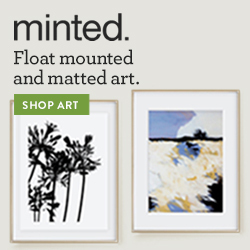 It is super stretchy, and perfect for stretch edge finishes. So, there you have it. Those are some basic techniques for applying different types of elastic. 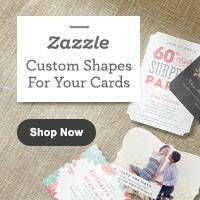 I hope you find these helpful! Thanks♥ for that tutorials, I am beginner in lingerie sewing and glad to find such good♥. super clear and informative post, thanks! With the Picot and Foldover elastic, you specify a zigzag stitch. But, I was wondering if it is possible to use the twin needle with those finishing options? Thank you! Yes! You can use the twin needle - any stitch that will allow the elastic to stretch will work just fine.